In the March issue of Architectural Digest, singer-songwriter Sheryl Crow invites us into her romantic Hollywood Hills estate. There are three houses on her 11-acre property, but she and her young sons Levi and Wyatt live in the 1926 Spanish Colonial hacienda (there’s also a 1909 Craftsman bungalow and a 19th century cottage that I’d love to see!). The living room is one of my favorite rooms of her house. There’s something about that fireplace, those tall, skinny windows, and the high, beamed ceilings that I really like. It just looks like a comfortable spot to hang out in. I wish we could see more of the kitchen. I want to see what kind of cabinets she has in there! 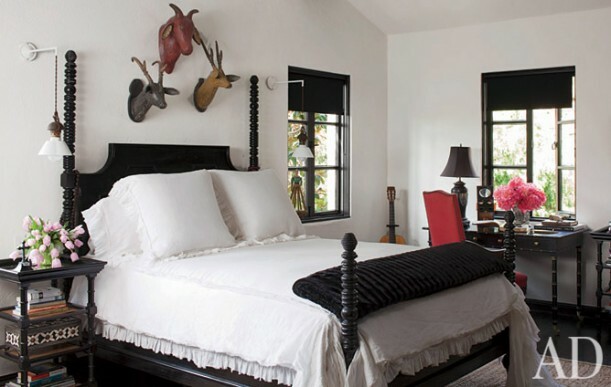 I like the simplicity of the black bed in the master bedroom. The animal heads, not so much. I’m starting to think I’m the only person left who hasn’t fallen for those things! They’re everywhere, aren’t they? 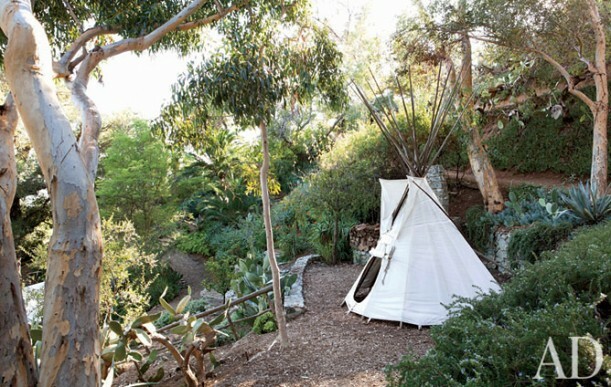 The photos were taken by Jim McHugh for Architectural Digest, and you can see all of them there–including the tepee in the garden that I imagine Levi and Wyatt will have fun playing in! You can also see pics of her Nashville “farmhouse” (term used loosely) that went up for auction recently here: Sheryl Crow’s Cross Creek Farm in Tennessee. Which do you like better–the Nashville house or this one? It’s on the market. You can see the listing here! I’m with you on th animal heads…..yuk! I find it sort of amusing that she has a bicycle over her fireplace. Can anyone say Lance Armstong? Perhaps she is still on friendly terms with Lance, Julia. I, too, am surprised that, in all places, she would chose to have animal heads mounted above her bed. Houses like this one, built in the 1920’s, never seem to lose their charm or go out of style. A classic, for sure. LOL! You beat me to it. I had the same thought! I do love it though. Her house looks very pretty. I don’t get the kitchen picture, though. Very odd composition, I think….. I agree, Julia, that the living room is so inviting! Thank you for admitting that you don’t like animal heads either. It frees me up to say, “I don’t either!” I just don’t get them, and since they are EVERYWHERE, I keep feeling like I should. I did, however, just buy the cutest porcelin white basset hound at Z Gallerie this weekend. Oddly enough, especially since I live in the south, I prefer this house to her Nashville farm house. I like the simplicity of this home compared to her farmhouse. 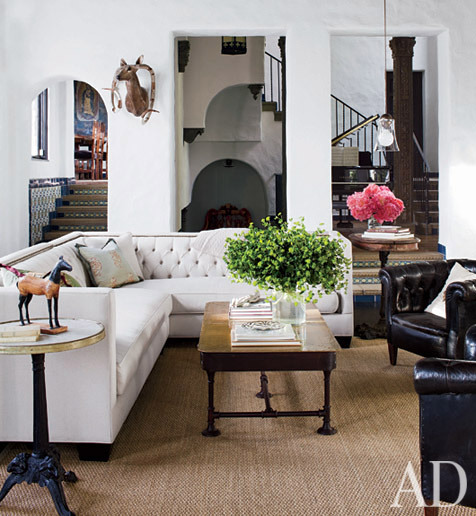 The tufted sectional is gorgeous and I’m with you on the animal heads – never been a fan. Have to say that the teepee is my favourite thing though. I like this Hollywood home way better than the Tennessee home. The TN home looks like someone else’ home. This one is more airy and bright. Something darker and more subdued about the TN home. Elle Decor or Elle did a story on her NYC loft earlier this year and it is also very hip. This home style is more in tune with her own personal style than the TN home seems. Great house! Finally a celebrity home that’s not cold and unviting like some of the others we saw. I wouldn’t want a spanish styled home as my regular home, but I wouldn’t mind having one for a vacation home. That living room is very inviting. I don’t care for animal heads either. They would scare me if I had one in my house. I might even have nightmares. I absolutely want those tile floors in the first photo & I love many of the other features and decor of her current home. However, I actually prefer the farmhouse & grounds in Nashville. Wonder if it has something to do with me being a lifelong Tennesseean? I’m with you on the animal head thing. It’s a trend I’ll definitely pass on. Don’t like real ones, don’t like “artistic interpretations” either. Yes, it seems like overnight the animal head thing is a craze! I think it’s creepy, but a lot of people seem to like it. I do love her living room. Very cozy. It’s interesting to compare the last few celebrity/designer homes that you’ve featured recently. This is the only one that seems like someone lives there. Thanks for sharing this! No animal heads for me either – YUCK! Just like most of the other celeb homes, this house, not a home, is very cold and has no personal touch to it. They all just want to put forward a decorated space done by someone else, not really create a home, I think. Eh…it’s okay, but not my style. I can appreciate that it’s pretty, but it’s not for me.And I thought I was the only person in blogland who didn’t like animal heads. They creep me out. I wonder how long it will be before they fall out of favor and all the thrift shops will be stuffed to the rafters with them? I like this house a little better, although I love the land surrounding the Tennessee home. I do like this house a bit more than the Nashville one. But I wish the walls were a creamier white or something. It’s so stark! What a beautiful home! I can see her personality on it and that’s how a home always should be…. reflecting who we are, our taste. Love it! Okay – so there’s a whole list of people here who don’t do animal heads. Add me to the list! I thought the arched doorways next to the square doorways was…interesting. Wouldn’t it look better one way or the other? Too much going on for me. I agree – wish we could see more of the kitchen. The bath room tile is wonderful. Great that she kept that, instead of ripping it out. It’s very classy. Love her! I’d pick this one too. wowza! I love this house. I think I would take down the animal heads though……. Thanks for the posting Julia! I needed a pick-me-up! As always, a very wonderful start to my day! Her home is very cozy and classy. I’m with you on the animal heads, though. Not feeling it. Funny story, my parents are moving and had a yard sale over the weekend. Their garage was open and my dad has a dozen sets of antlers on the walls (as he was a big hunter) and people were falling all over themselves asking to buy those things! Many had been there since I was a kid. They were passing by antiques to get to the antlers (which my dad refused to sell.) No, I don’t get it. What…you don’t have animal heads on your walls yet? lol Yea, I can live w/o that part too. But I do love her simple style. Thx for sharing! Love this house! The Spanish architecture is beautiful. Not crazy about the black tile – yuck. But the living room is definitely the best. Add me to the list of non-animal head likers. I prefer this house over the Tennessee estate…it just has something warm and cozy about it. Historic, maybe? Unique? And I am drooling over the library! I agree that this house feels more warm and inviting than the one in Tennessee…I love all the tile! But I don’t know how she sleeps at night with those creepy animal heads hovering over her bed. I’m on the fence about animal heads in general, but I wouldn’t want them in my bedroom. I’m normally loathe any sort of animal head display but I have to admit I chuckled out loud seeing the rather “animated-like” ones she chose to display over the bed. If you’re inclined to enjoy that kind of thing, then I definitely think that is the ONLY way to go! All in all, I rather thought the house was a bit cold but I did really like the bicycle, I thought it was an interesting thing to find displayed with such prominence in a living space and yes, I kind of think it may have been a special gift perhaps or has some sort of “significance” to her and we all should have special things like that in our homes identifying who we really are and where we’ve been. This house is so beautiful! As a big fan of black and white, I love this stylish and simplistic home. It seemed very light and open and very, her. I love her bathroom! So retro and glamorous! I’m with you, that living room looks so relaxing and comfortable, and I want to see more of her kitchen! In terms of decor, and use of color, I’ll vote for the house in TN. I love the Spanish Colonial architecture of the Hollywood Hills home, but I’m simply sick to death of white everywhere. It doesn’t fit this house, in any event. Nor does the funky, elcletic attempt at ‘amusing’ decor – – like the animal heads and the bike above the fireplace. Count me among the anti animal-heads. Wonder if the bike over the FP is a way of paying homage to Lance?????? Sorry, I’m not Sha….lol. Anyway just went back and read other comments….seems we all agree on the animal heads AND Lance Armstrong! I love that the bathroom has original tile! When guests comment on my bathroom I’m just gonna tell them Sheryl Crow has a vintage bathroom too. She is fabulous. I really like this home (minus the animal heads : )! I have always (even before they became so widely seen) loved animal heads. However, I’m sure it’s bad feng shui to have them over the bed. The House is stylishly modern and historic. Peace and Serenity is lived in the parts of the house. Neutral colors blend well as it displays sophistication in a classical way. Hi Julia love the house hate animal heads I’m glad to say I don’t think we have them here. This kind of home would never go out of style. Must tell you I just received a book I ordered Barbra Streisand – My Passion For Design it’s a beautiful book I do love american architecture – the barn style is amazing and the grounds wow.. I do hope you get a chance to have a look. Regards Esther from Sydney. Nice house, but the bicycle above the fireplace and the black tiles in the bedroom are overkill. Liked the teepee. The rest was Very sterile. Sorry that young boys must be subjected to such clean perfection, looks like NO fun. I’m sorry…but yuck. I like Sheryl Crow, but I have never been a fan of any of her houses that I have seen featured here. Her design aesthetic seems to be spartan/cold/antique. What’s with the weird little statues and the bike hanging over the fire place? There is no color. With the exception of the sofa, all of the furniture looks super stiff and uncomfortable. I would hate living there! It’s so weird, because her personality seems so vibrant and warm when you hear her in interviews, and this decor is just…not. Something just seems “off” about her homes. P.S. I just moved to Montana. Want to talk about animal heads? And it isn’t just a trend here, either….never seen so many moose heads in all my life!!!! Too much white – white walls, white furniture, while linens. blah, bland, boring. The animal heads freak me out. I’d like to see it without all the weird animal heads and that bike over the fireplace – I’d like to see some happy color – not the sterile, institutional white. She has one of the coolest celebrity houses ever…I’d love to see the other two that are on the property also. And Julia…you’re not alone on the animal head thing, I made Mr.24 put his up in his office at work, there’s no way I want animal heads on my walls…pictures of alive animal heads yes…painted animal heads, yes…the other, no thank you. I know I’m very late to the conversation, but I do want to say that I like the home. At first I thought the bicycle somewhat strange and I probably wouldn’t do it, but it’s grown on me given that it is unique. The animal heads thing is all the rage. I guess I’m getting immune to it as it is featured enough on house tours over at AT. If you are into that kind of thing they would work better elsewhere in the home. My personal preference would be to not place them over the bed. I do like the bedroom otherwise, but I’d be more inclined to place a beautiful painting over the headboard or a collection of pictures just to add a spot of color and just because that is my preference.